This personalized birthstone name necklace would make an ideal 30th birthday gift, with its 3 rings representing each decade. All three rings are all interlinked and free-moving and they symbolise wholeness, strength, unity and everlasting love. One ring has a hammered/textured finish, one is hand-crafted in plain silver and the other one is beaded. The plain ring can be personalized with any name or message of your choosing or equally you can leave it blank, it looks just as good either way! Sitting in the centre of the pendant is a gorgeous wire wrapped semi-precious birthstone. You are free to choose any applicable birthstone and all our birthstones are guaranteed to be of at least A grade quality and usually higher. Please see the alternative image for a selection of the birthstones we have available and the stones that are applicable to each month of the year. 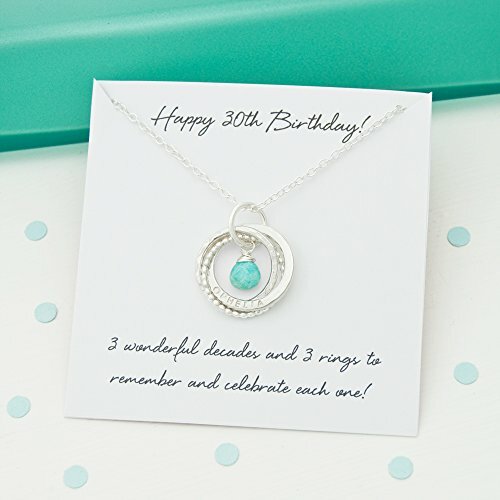 Because this 30th Birthday name necklace is handmade it will have an organic look and feel that sets it apart from mass-produced, machine made jewelry. If you choose to personalize this necklace all the characters will be stamped by hand, and as such they may not be perfectly aligned or straight. This is part of the design and it gives each necklace its own unique character, quirkiness and charm. Handstamping helps to create that unique handmade look and finish that comes from a piece of jewelry that was created especially for you, by a skilled craftsperson and not a machine, on an assembly line. Your jewelry will arrive in a silver embossed Pretty Serendipity gift box, wrapped in tissue paper. As a special 'thank you' for purchasing one of our handmade creations we'll also send you a complimentary polishing cloth to help keep your jewelry looking sparkling, shiny and new. If you have any questions about this product by Pretty Serendipity, contact us by completing and submitting the form below. If you are looking for a specif part number, please include it with your message.